Senior living has changed significantly over the past several decades. Say goodbye to the sterile environments of mid-century homes, and hello to personalization and hospitality! In senior living interior design, strategically planning the colors and patterns is more important than ever. From the colors of the carpet to the patterns on the wall, you want seniors to feel happy and protected in a care center that is designed specifically for them. There are essential aspects to remember to ensure the feeling of “home” and making sure the residents feel safe. Certain colors and patterns increase socialization, can cause strain on eyes and can even create a sense of panic. It’s essential to hire a firm that keeps these design aspects in mind and has experience designing specifically for senior living. 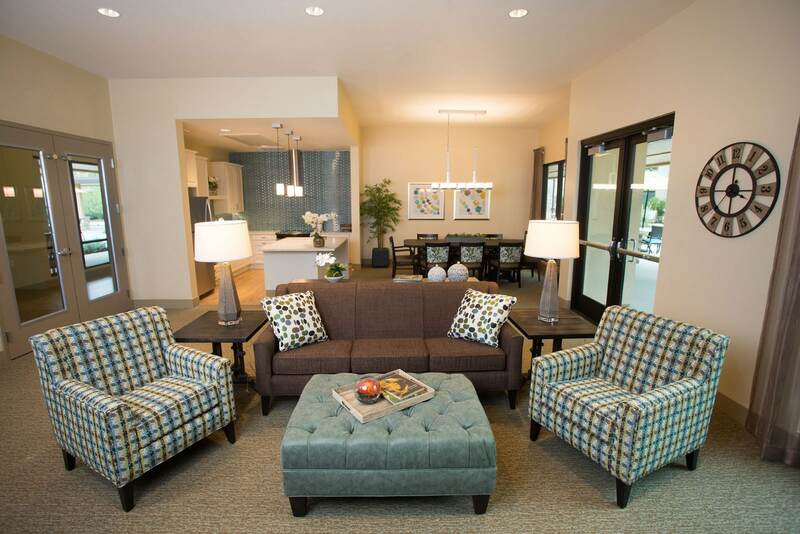 Here are a couple of tips to keep in mind for senior living interior design. Neutral colors are widely appealing and easy for aging eyes to register. It also allows other fabrics, paintings, and designs to pop more creating a fresh and airy atmosphere. (And right now, some bolder statement colors are in!) Also, when choosing neutral colors for areas like corridors and dining rooms, refrain from choosing ones that are too light as they will easily show stains. And for that reason, avoid the use of white in places that may be in common areas that tend to be the most used and crowded. Certain colors, like warm tones, create energy and excitement and even stimulate appetite. While alternatively, cool tones can create soothing and relaxing environments. It’s important to note, however, that colors like blue, turquoise and green are the hardest colors for the aging eye to perceive. Avoiding those colors in places of most importance may be good. In seniors, the eye adds a yellow tint; this is a factor to keep in mind for designers when choosing color and pattern in interior design. A yellow tint may throw off the look of specific patterns, or even may make colors blend more, which can be deceiving for seniors’ eyes. Did you know that patterns can be registered as something else and may cause feelings of stress or panic? Due to this, it’s best to use soft organic patterns or linear striations for senior living interior design. Using contrasting colors on different surfaces helps residents tell the difference between where one element begins and the other ends. An important example is the differing surfaces of the floor vs. the wall. Using different colors, or a molding that breaks up similar colors, allows the resident to notice the difference between the two surfaces and helps them avoid safety concerns such as bumping into walls. Growing older doesn’t mean that your home should be any less comfortable, stylish or safe! While it’s essential to have a safe and healthy living environment, it’s also important to stay fashionable and creative. Keeping these pattern and colors tips in mind will have a profound effect on the success of the senior living home, but more importantly on the residents themselves. Have any questions on the importance of colors and patterns in senior living? We would love to hear from you!